What's on Your Wall? 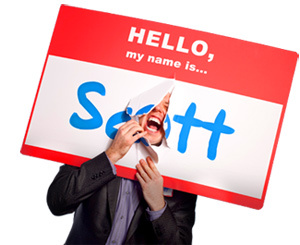 5 Motivation Decorations for Success - HELLO, my name is Scott! If you’re self-employed like me, regular “punches in the face” can do you some good. To keep yourself on point. And here’s the good news: the perfect resource to accomplish these goals is right before your eyes. But from a self-motivational standpoint, covering your office walls with personalized, vibrant and positive decorations can actually help you become more successful. Take a few of your biggest, most important goals. Post them nice and big – right in front of your face! Make sure they’re inescapable from your eyesight so you HAVE to look at them at least three times a day. Odds of you accomplishing your goals will triple. Promise. The one (and only) thing I took away from The Seven Habits was the section about creating a personal mission statement. Years later, I still keep my PMS posted to the left of my door. That way I see it every time I leave. I suggest you do the same. Every time an article of mine appears in a print publication, I hang a copy on my wall. Not because I’m an egomaniac, but because surrounding myself with visual reminders of small victories builds confidence. So, think back to your three best accomplishments from the past year. Find some way to represent them visually, and stick ‘em up there! These are the perfect tools (er, words) to keep you motivated. Go see my friends at Quote Garden for some great material. 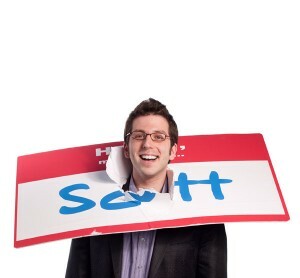 Then grab a few of those giant sticky notes and post several of your favorite one-liners around your office. ‘Act as if you already are the person you want to become and you will eventually become the person you want to become,’ said my mentor. So, think about your long-term goals and dreams. Maybe it’s to own a beach house. Or to achieve a senior-level position. Or to secure an appearance on Oprah. Or to be featured on the cover of a magazine. Whatever your goal is, you MUST actually, physically, literally, create an image of having already achieved it. Hell, sneak into the CEO’s office and take a picture of yourself sitting in her chair if you have to! I don’t care. Just do it. I know it sounds ridiculous. But trust me. When your goal comes to fruition, people won’t be laughing – they’ll be applauding. Look. I know it seems like a lot of stuff to hang on your wall. But why not? It’s just empty space. You may as well cover it with something productive. OH, AND HERE’S THE BEST PART: next time a customer or coworker comes into your office, they’re gonna stop and look around. And they will be amazed. Because you’ve visually PROVED to them that you’re dedicated to success.